An "international currency war" is underway, Brazil's finance minister, Guido Mantega, has warned. His comments follow a series of interventions by governments to weaken their currencies and boost export competitiveness. Japan, South Korea, and Taiwan are among those that have recently tried to cut the value of their currencies. 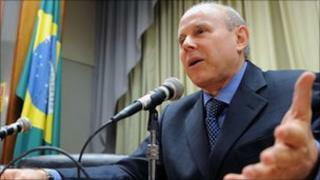 In a speech in Sao Paulo, Mr Mantega said the competitive devaluations were effectively a new trade war. "We're in the midst of an international currency war," he told a meeting of industrial leaders. "This threatens us because it takes away our competitiveness. "The advanced countries are seeking to devalue their currencies." Mr Mantega has been trying to talk down the value of Brazilian real. The currency is at a 10-month high against the dollar, and has been described by analysts at Goldman Sachs as the world's most overvalued major currency. Last week's $70bn share offering by state-oil company Petrobras has contributed to a massive inflow of dollars to Brazil, which is attractive to foreign investors because of high interest rates and its rapid economic growth. Mantega said the country still had an "arsenal" of tools available to weaken the real, although he did not explicitly talk about intervention to weaken the currency.